July 14 (18) - Saint Camillus de Lellis, Priest - Optional Memorial - My Catholic Life! Like so many saints, Camillus ran hard in whatever direction he was running. When he was a soldier, he ran hard toward the battle. When he was a gambler, he ran hard toward the betting tables. When he was a sinner, he ran hard toward his taste of the day. And when he had a conversion, he ran hard toward the tabernacle. And there, finally, he stopped running. Once he found God, he stayed with Him. Today’s saint spent long hours with Christ in the Blessed Sacrament. This contemplation fueled his soul, and he motored through each day with a high octane love for the sick and the dying, which attracted numerous followers, led to the founding of a religious order, and eventually made Camillus a saint. As a physically large teenager, Camillus became a soldier, alongside his soldier father, to fight the Turks. In the army he learned to gamble, an addiction that matured with him, and which ultimately reduced him to abject poverty. At a low point in his life, he volunteered to work at a Franciscan monastery under construction and was inspired by a Capuchin monk to seek admission to the order. But they wouldn’t take him. Camillus had a serious leg wound that refused to heal. He would have been more burden than blessing, so he moved on. He went to Rome to care for the sick in a hospital where he had previously been a patient. But he was repelled by the inadequate medical care, the moral deprivation of the nurses, and the lack of spiritual attention given to the patients. Camillus looked in the mirror for something better and decided to act by himself. Camillus was inspired by his saintly spiritual director, Saint Philip Neri, to establish a company of consecrated men who would serve the sick purely out of love for God. They served in the hospital of the Holy Spirit, still found today on the Tiber river close to the Vatican. Camillus and his co-workers earned a reputation for providing excellent medical care, for being indefatigable, and for doing their work with an intense spirit of prayer. While carrying out this demanding apostolate, Camillus also attended seminary and was ordained a priest in 1584. As the years passed, more men joined, new houses were established in other cities, and the rule for the Order of Clerks Regular, Ministers of the Infirm (M.I. ), simply known as the Camillians, was approved by the Pope in 1591. Father Camillus instituted medical reforms that were rare for his time in regard to cleanliness, diet, infectious diseases, the search for cures, and the separation of healthcare administration from healthcare itself. When his order expanded to other countries, they even staffed a medical field unit accompanying soldiers in battle, an important innovation. This, together with his order’s habit bearing a large, simple, red cross on the front, made Camillus a precursor of the modern Red Cross. Saint Camillus was practical as well as mystical. He wanted the best, physically, spiritually, and morally, for all those he cared for. Every patient was his Lord and Master. No patient, no matter how diseased, foul, dirty, or rude, was beyond his care. He and his brothers even took a special fourth vow to care for those with the plague who might infect them. Two Camillians died of the plague in his own lifetime. “More love in those hands brother,” was his refrain to his confreres. His example has resonated. The work of the Camillians continues today in various countries. Saint Camillus succumbed to various serious diseases in 1614 in Rome, his order well established. He was canonized in 1746 and a large statue of him adorns a niche in the central nave of Saint Peter’s Basilica. Along with Saint John of God, who was also a soldier, Saint Camillus is the patron saint of hospitals and the sick. Just a few hundred feet from the hordes of tourists crushed together outside of Rome’s pantheon, the modest but luxurious baroque church of Saint Mary Magdalene fronts a small piazza. Inside, usually alone and resting in peace in the right transept, are the remains of Saint Camillus of Lellis. 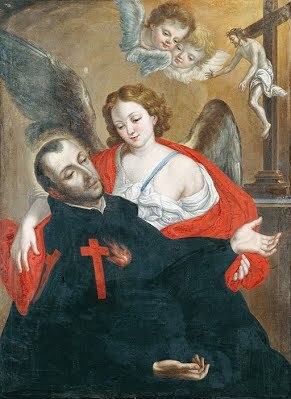 Saint Camillus, you knew the rough life of the soldier, gambler, and wanderer. Because of your experiences, you practised great empathy for the outcast, the sick, and the dying. Help us to be like you, to translate our empathy into action, and to be motivated primarily by love of God.